In many European and American cities found rectangular squares with porticos which allow circulate around them protected from rain or sun. This design was first used in Priene Miletus by Hipodamo, Father of urbanism. The Greek sage was commissioned to plan and devised an entire city street perpendicular favoring lighting and ventilation as well as the future growth of the city. From Bogota to Lisbon passing by the French fortified or extensions of Barcelona or Madrid, many cities have been built following this pattern. Priene was the first success and was exported to the world. Is priene 120 Km al sur de Izmir y a 50 Ephesus and is a place full of symbols of our civilization. The city was built at the mouth of the river meanders, discourse whose sinuous curves gave name to the rivers. However, Meanders who was the original city ended, their sludge eventually clog the port. In the century 4 AC decided to create the city from scratch on the slopes of Mount Mycale and architect of Miletus was Hipodamo responsible for designing it. The father of urban planning decided that the new city would have six lanes eastbound fifteen perpendicular streets west and north-south. Also made a new design for the agora, the central plaza would be a simple irregular space with buildings around. In his stead, designed a rectangular plaza surrounded by buildings with porches that could have multiple uses, including the commercial. He was born the modern city and Hippodamus was commissioned to plan the Piraeus and Rhodes town. Alexander was in Priene in 334 AC and paid for the construction of a temple to Athena, corresponded to the architect commissioned Pittheus, constructor of the Mausoleum at Halicarnassus, one of the Seven Wonders of the World. The magnificent temple was Ionic 34 columns and although it was destroyed by an earthquake, five columns have been put back in place. The views of the valley meanders from the temple give an idea of ​​the greatness that took place. In this sense, should be mentioned that one of the Seven Sages of Greece, Bias of Priene, also born and lived in the city. 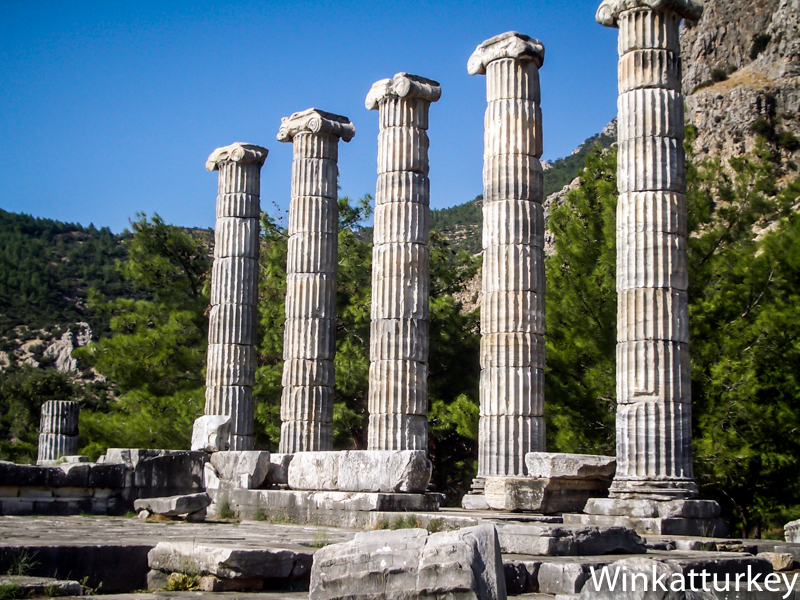 As Priene was eventually abandoned because the river returned to disable both ports of the new city, the ruins are preserved in great condition. You can still walk the streets and see the neat and modern layout of the city, of which must go to the theater with five chairs and marble notables Sleeps 5.000 people. Having grown trees among the ruins, its shadow makes the visit to Priene become more pleasant in summer than other historical sites.